These days with a baby in the house, my baking time is really limited. I find the best way to be able to quickly make delicious, lovely cookies is to always have a batch of my favourite dark chocolate rolled cookie dough in the freezer so I can take a chunk out and whip something up fast. The fastest method for frosting is to use the same cutter on thin fondant and stick it to the cookies (even if they’re still warm, as long as they’re not hot) with a bit of corn syrup thinned with water. 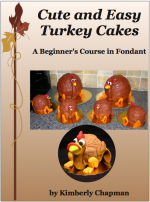 Then you can draw on the fondant with edible ink markers for any needed detail. 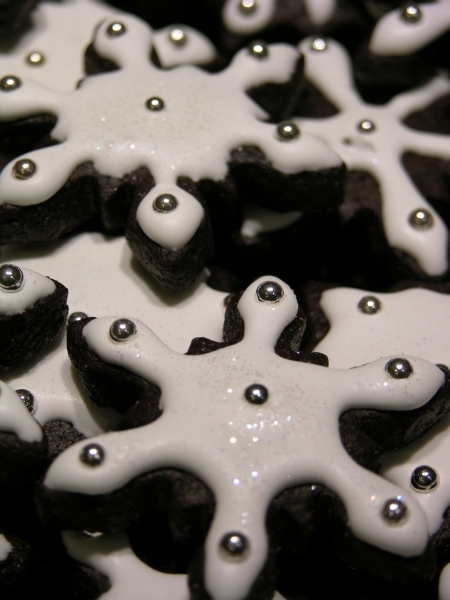 And if there’s time, thinned royal icing decorations are beautiful and tasty. 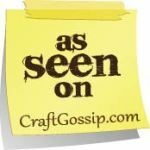 I have lots of cookie cutters, and further down this post will highlight some of my recent favourites. But what do you do if you need a shape for which you don’t have a cutter and can’t get one in time, or maybe that cutter doesn’t even exist? If you just need to do a few, the easiest method is to do a Google image search for the item, find an image that suits you, save it, resize it in your program of choice to suit your needs, and print it out. If you’re just doing one or two, you can cut it out and place the paper right on your dough, then trim around with a knife. If you are doing several or your dough is very greasy, you can faux-laminate the paper first (do this BEFORE cutting the paper) by covering it with clear packing tape. 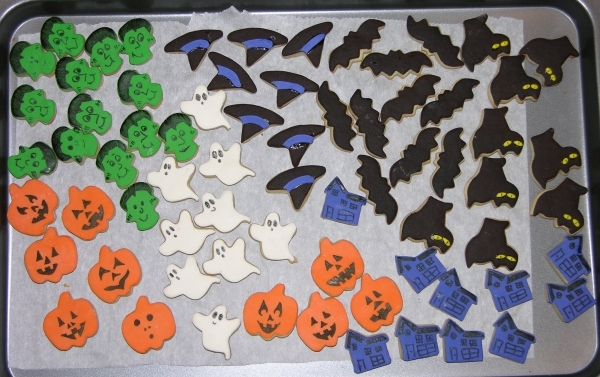 I did this for the Doctor Who sonic screwdriver cookies and the Alien facehugger cookies earlier this year. The main downsides to cutting around a template are that it is slow, tedious, and leaves a ragged edge on the dough. I went onto Lowe’s website and ordered some of their copper-covered tab tape (sometimes called hanger’s tape) and some lead-free, potable-use solder for pickup at the store up the street so I could get it on the way to getting my kid home from school without having to actually search the aisles for anything (this is super-convenient). I already had a plumber’s torch that I use for sugar work. You can see the lumpy plugs of solder holding the ends together. I’d strongly advise the suggested alternate strategy in the video of using some kind of at least nominally food-safe tape on the ends instead. You can see that some of them are reversed, a perk of the cutter not having a folded-over safety edge. Let me make it clear that although the cutters came out okay, worked well, and are even reversible since they don’t have a crimped safety edge (which also makes them harder on hands), this method isn’t exactly easy. I’d definitely advocate for buying cutters you need in advance when you can, but keeping some tab tape around for sudden cookie emergencies. And if you’re a known baker parent with a kid in school and clubs, you will have a cookie emergency eventually. Quick and easy royal icing decorations, flooded first and then piped for the lettering. 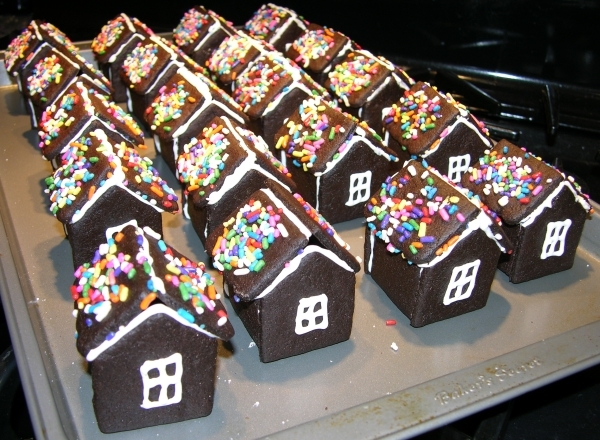 To save time, I put the roof segments on their own tray and pre-covered them with sprinkles. That way all I needed to do for decorations was a window on the back, a line and circle on the front, and the royal needed to assemble the houses. Much easier than they look, and these were the hit of my daughter’s school event. Because these are so small, they’re a cinch to put together with no supports needed. Basic royal icing piped to the joints and all of the pieces pushed gently but firmly together and set to dry. This cutter rocks! The houses from the back with simple piped windows. 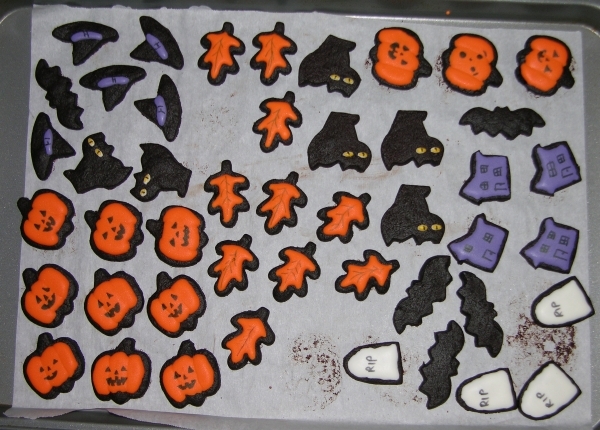 One tray of last year’s cookies with fondant cut with the same cutter as the cookie and attached with watered-down corn syrup. Edible ink markers were used for details. 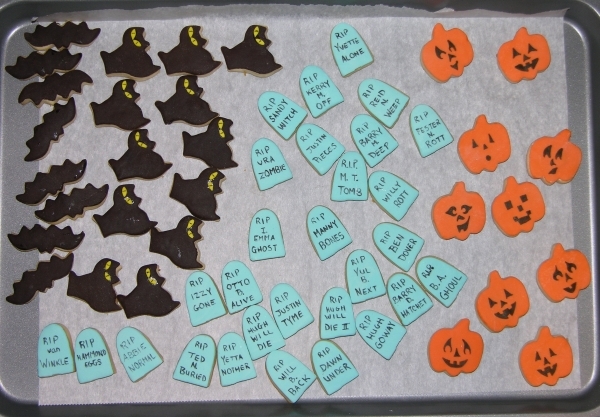 The cookies were the Ann Clark lemon recipe, and the bats and cats have Satin Ice Dark Chocolate fondant on which is an insanely delicious combination. Recipe and methodology as the photo above, and this time I put punny jokes on the gravestones. 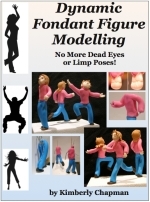 That made them very popular with the kids. 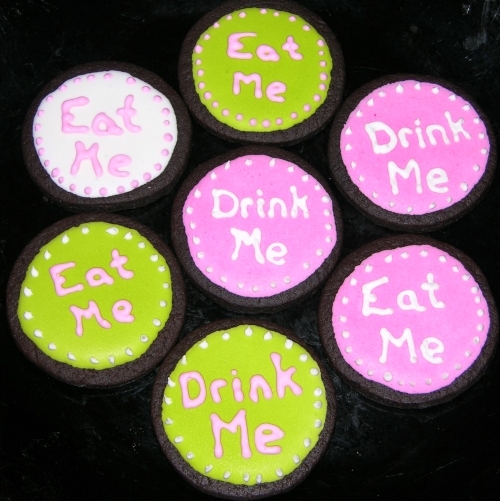 These ones were for 2013 and have royal icing with edible ink marker designs added on. 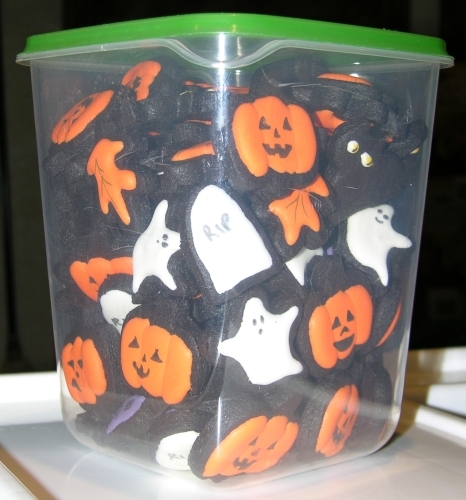 The cats’ eyes are just yellow dots of icing with black lines drawn on, and the bats are left icing-free. Because I was taking this set to a playdate party where I wasn’t sure if they’d be served on a plate or not, I took the time to prop them upright in a clear tub so folks could still see a sort of display of what was inside. 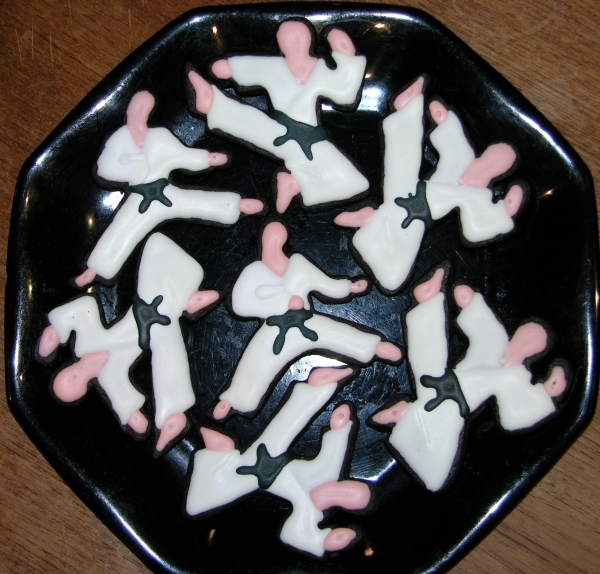 I’ve only used parts of this Karate Cookie Cutter Set and only once, but given that my older daughter is really into her karate lessons and her dojo is a non-profit run by women specializing in karate and self-defense for girls and women, I anticipate making a lot more karate cookies! These ones were for their fall Kickathon fundraiser, so I just used the two kick styles in the set. 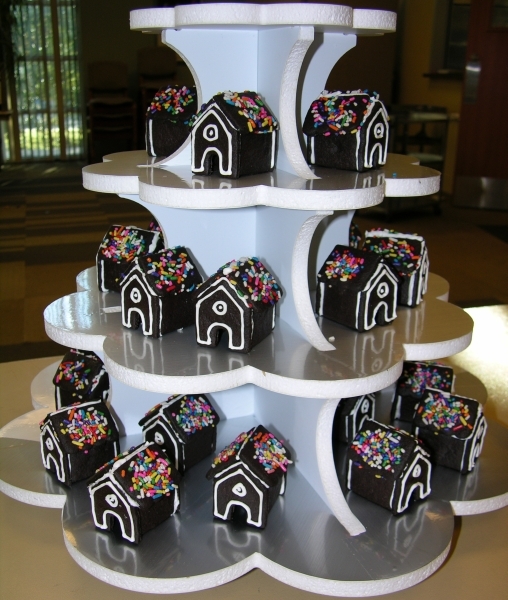 A simple royal icing decoration made these a hit of the event. Eat enough of these and you won’t look anything like them. 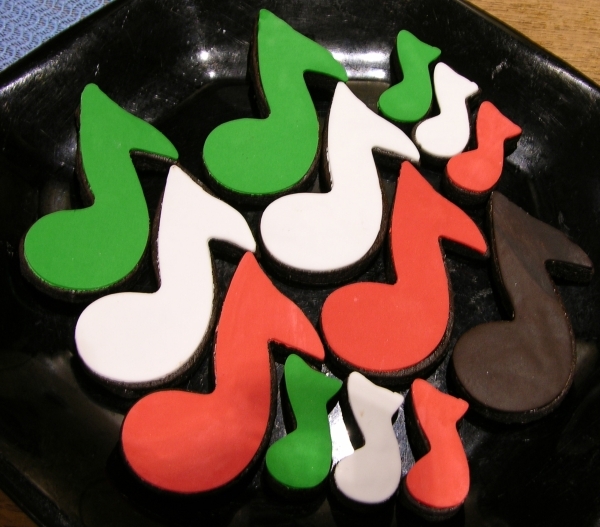 I have two sizes of music note cutters that I’ve used for cookies and fondant effects for Biscuit Brothers events in the past, and most recently for another Gilbert and Sullivan Society of Austin event. This time they were in Italian flag colours to go with the Italian theme of that musicale. 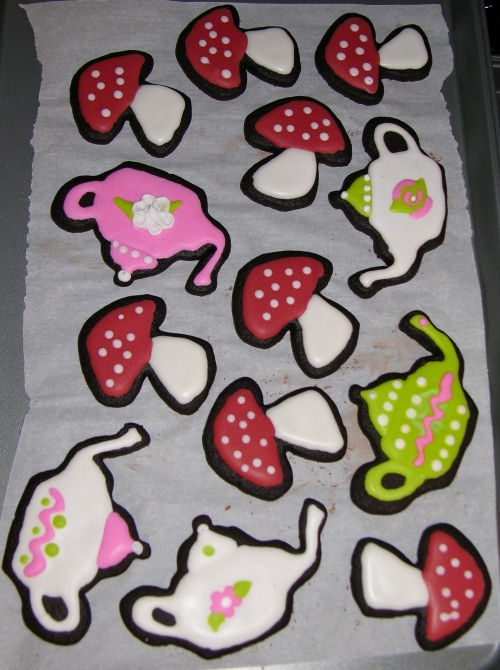 Once again, fondant cut from the same cutter as the cookie and attached with watered down corn syrup. Easy and effective. Graduated sets of the same shape are really useful. I have Ateco sets of squares, circles, ovals, daisies, and triangles. 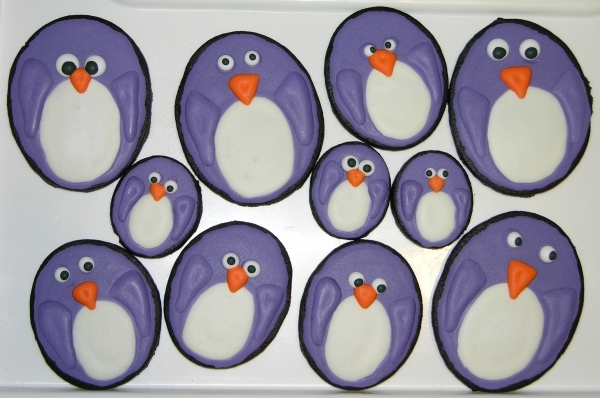 Because purple penguins, that’s why. I cannot overstate how happy the phrase “extra eyes” makes me. 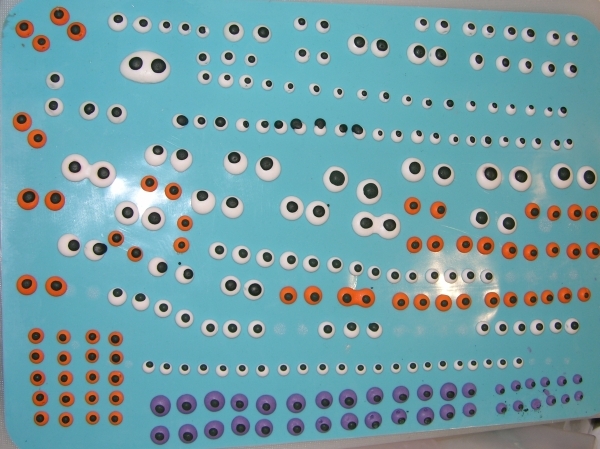 GOOGLY EYE ALL THE THINGS! Lastly for now are these lovely Autumn Carpenter snowflake cutters that come with matching texture mats. Again, I got these in an after-holiday sale one year because that’s often the best way to get pricey cutter sets. 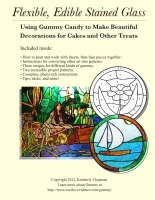 I wish I had more cause to use the texture mats because they’re lovely, but I often end up just using royal icing and dragees, as I did this year. This year I also added a bit of Disco dust for sparkle, and the combo hid what a terrible job I did with uneven royal application in the first place. Hah, I love cheating strategies in decorating! Dragees and Disco Dust disguise decrepit decorating. Mmm, alliteration. 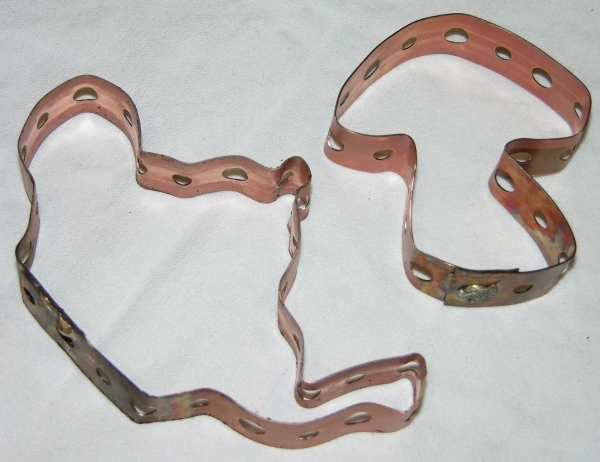 I probably have other old photos of cookies that I haven’t gotten around to posting, but that gives you a general idea of cutters I recommend for busy bakers along with some techniques that hopefully help you achieve awesome results with minimal effort. All evidence consumed, om nom nom. This entry was posted in Cookies, Experimental Techniques, Products. Bookmark the permalink. Quite likely, although the aluminum flashing itself can be difficult to shape and cut. It's also more expensive and often pre-bent at an angle or in really wide strips. But if someone had tin snips and a workbench, that should also work. The tab tape was super easy, though. 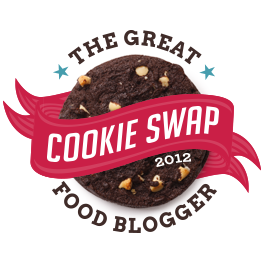 Speaking of cookies, NEVER use cookie cutters with those fundraising cookie doughs that some schools sell. I don’t know why, but that recipe they use is prone to expand. I had chunky lines instead of candy canes and the world’s fattest snowmen. Ugh, yes, many doughs are too expandy for cutters. It's one of the reasons I like this chocolate dough so much…they hold their shape well, they taste good, they're a perfect cookie for this sort of thing.